We LOVE pretend play in our house. So much that it deserves it’s own gift guide! Again, most of these things my kids either have, or are on their wish list! Doll Farmhouse. I mean. Is this not the cutest thing you’ve ever seen? I want to live in it. We have the version from last year (which is still for sale here) and it’s so cute and has held up to daily play really well. Dollhouse furniture. The dollhouse above comes with furniture, but I really like this set too. And this coordinating set. Tee Pee. Every kid needs a tee pee. All three of my kids play with ours frequently. And I love the buffalo check on this one! Workbench. We got this for Hudson, but Sadie and Belle love to play with it too. The saw makes noise and it’s just a fun set for pretending to build stuff! Pink Kitchen. We have this exact kitchen and it is played with every single day in our house. Both girls are obsessed with it. 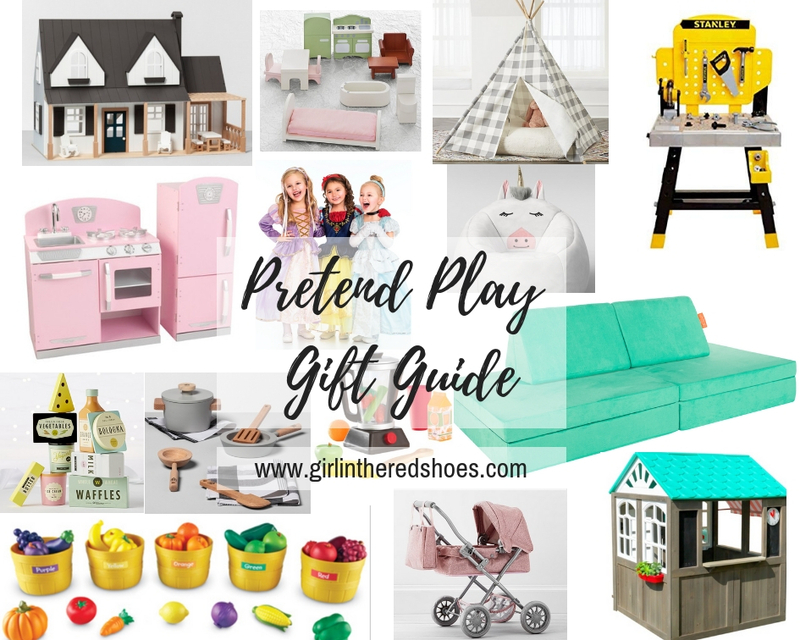 By far it is our favorite pretend play toy! Good for ages 1-6. If you need one that is more gender neutral, I love this white kitchen with a farmhouse sink too! Princess Dresses and Dress Up. My girls LOVE to dress up. They have several of these dresses from Little Adventures and they are the best quality, not scratchy, and machine washable. Unicorn Bean Bag. I mean. So fun. It comes in a fox, cat, and alligator too! Pretend Food. This set is darling! My girls would LOVE it. Kitchen Accessories. If you have a play kitchen, you need this set! So cute! Blender. Every kitchen needs a fun blender. Nugget. Santa is bringing this to our kids this year and I am SO excited to not have to tear up my couch cushions every time they want to play fort. It’s a big soft piece of furniture that can be put together in many fun designs/ways and forts to play in. They are going to love it and I can see all three of them playing with this for hours. Totally worth the investment! Farmers Market Fruit and Vegetable Sorting Set. We have had this since Hudson was little and it is by far the BEST play food set ever. It comes with a ton of food and five baskets to sort them by color. I HIGHLY recommend this set! Stroller. We don’t have this, but I know Sadie (and Belle too) would love to push their babies around in this. Play House. We have a similar one, and all three kids love playing in it. And rumor has it, this exact house will be $100 off on Black Friday!